When Vern Clark became the Chief of Naval Operations in 2001, he made alignment one of his top five goals for the Navy. He also made George Labovitz and Victor Rosansky's pioneering book, The Power of Alignment (1997), required reading for every admiral. Under Clark's leadership, the U.S. Navy underwent one of the greatest -- and most successful -- organizational transformations in its 200-year history. Now, Labovitz and Rosansky introduce the highly anticipated follow-up to their groundbreaking book: Rapid Realignment. Case studies from a broad array of companies, including FedEx, Quest Diagnostics, the U.S. Navy, Dana Farber/Children's Hospital Cancer Center, Farmington Bank, and others clearly illustrate the authors' methods, demonstrating that they work in any industry. 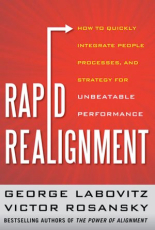 Rapid Realignment provides a practical blueprint for "wowing" customers and reaching peak organizational performance -- no matter what today's turbulent world throws your way.